Welcome to the cruel world of Trevor McNulty. No matter how hard he tries, this seventeen year-old just can’t get a break. Through no fault of his own, he finds himself living with his alcoholic uncle on the outskirts of Cleveland. His days are filled with garbage-picking and hanging out with his seventy year-old neighbor, who also happens to be his best friend.One early morning while scanning the streets in a wealthy suburb, he meets Bea, a rebellious rich girl with problems of her own. She’s smart, cute, and a glimmer of light in his dark world.But in the midst of their budding romance, Bea’s beautiful mother enters the picture with an agenda of her own. She sets off a chain of events so shocking and destructive, Trevor's crazy life soon becomes more than he can handle. 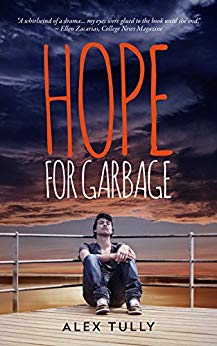 While he is desperate to save his relationship with Bea, he learns that nothing in his world can be saved unless he first saves himself.Hope for Garbage is a story about resilience—about overcoming adversity under the most extraordinary circumstances—about never, ever, giving up hope.Because sooner or later, everybody gets a break.